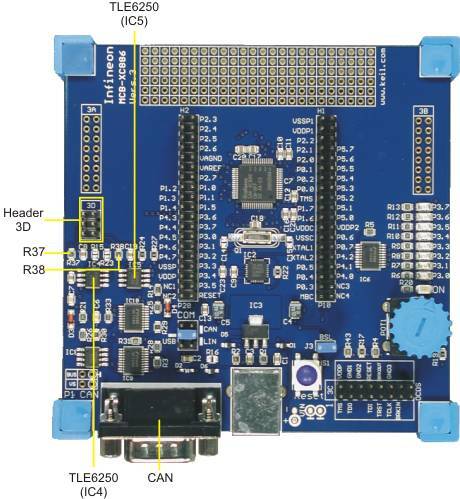 The dual CAN interface uses the TLE 6250 CAN drivers (IC4 for CAN0 and IC5 for CAN1) and termination resistors (R37 for CAN0 and R38 for CAN1) on the MCBXC88x board. The CANL and CANH signals for both CAN0 and CAN1 are accessible at header 3D. The DB9 connector may be configured as a CAN connector. When the COM jumper is in the CAN position, the shunts installed at R24 and R27 connect CAN1 signals to the DB9 connector. 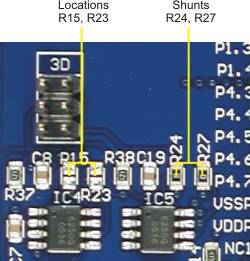 Pin 2 provides the CANL signal and Pin 7 provides the CANH signal. To connect CAN0 signals to Pins 2 and 7 of the DB9 connector, move shunts R24 and R27 to locations R15 and R23. CAN termination resistors make it easy to connect the MCBXC88x board to your CAN network but they are not always required. When connecting the MCBXC88x Board to a CAN network, you may need to remove the termination resistors.